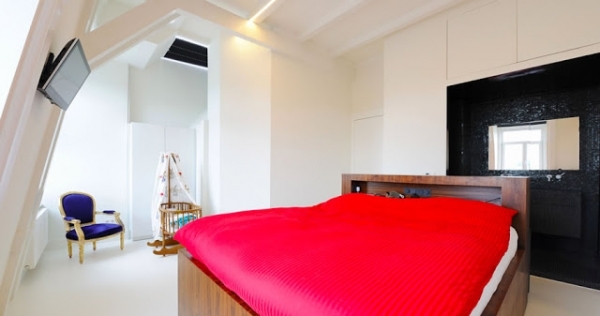 This Amsterdam house is wonderfully bright and open. 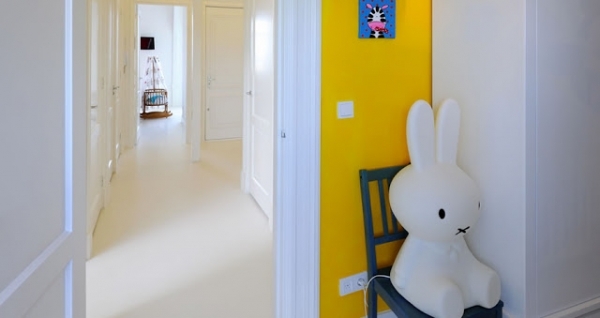 We are in love with the touches of color and the clean and simple design. In the living room, a large gray sofa is complemented with beautifully designed pillows with bright colors. 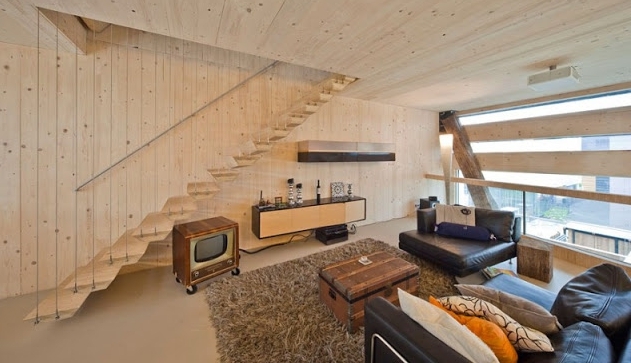 A simple wooden table sits in the middle of the large sofa, adding a bit of warmth to the cool design. 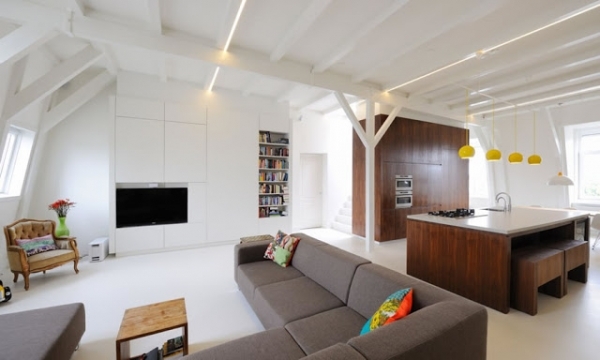 Beautiful beams line the white ceiling, and white floors and modern white cabinets fill the space. We love the bookshelf, it helps to break up all the white. The chair by the cabinets is absolutely gorgeous with its neutral color and fabulous detail. A small window provides a good amount of natural light, and a green vase filled with red flowers, brings even more color to the space. 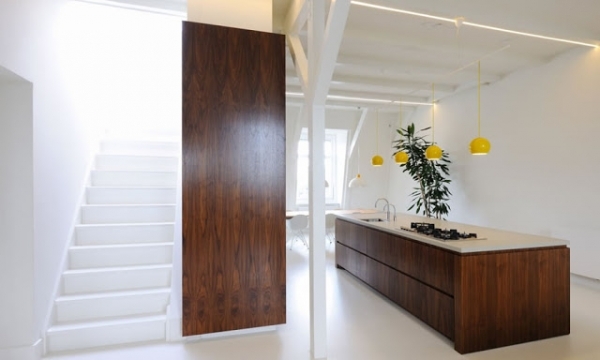 The kitchen in this Amsterdam house uses dark wood to anchor the white home. Wooden cabinets, and a wooden island, with a white countertop, sits in between the living room and the dining room. 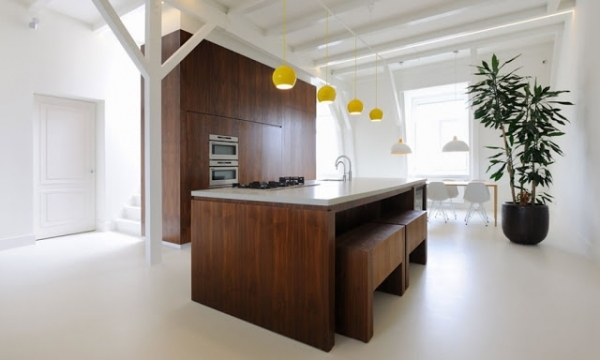 The wooden stools are the perfect touch, matching the island, and keeping in line with the sleek modern design. The beautiful beams continue on the ceiling, and striking yellow lights hang over the island, adding an outstanding pop of color to this delightful design. A large green plant separates the kitchen from the dining room. 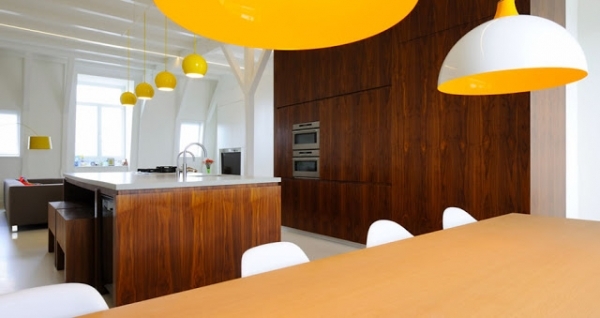 In the dining room, a light wooden table fills the space. The relationship between the light wood and the dark wood is gorgeous, bringing a significant amount of interest to the area. White and red modern chairs surround the table, adding another wonderful dose of color. 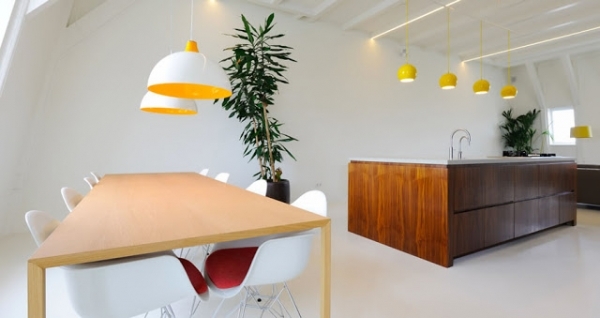 Two white and yellow lights hang over the table, connecting to the lighting in the kitchen: positively lovely. 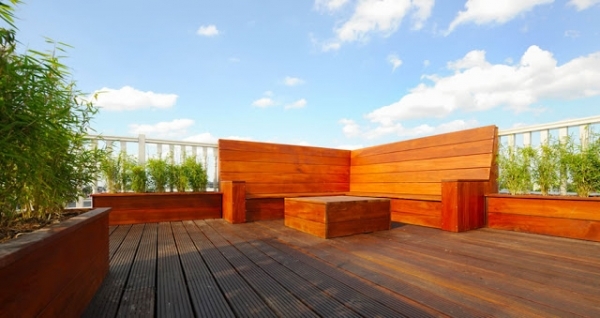 The outdoor space is sleek and inviting in this Amsterdam house. We adore the warmth of the wood and the green plants. 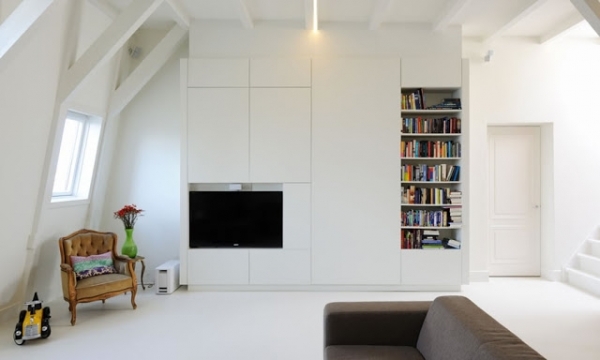 What do you think about the clean and simple design in this Amsterdam house?